How to enrich peoples’ lives and enable them to use their full potential by creating Novel Experiences. As human beings, we all feel generally attracted to anything new: different things, unfamiliar surroundings, sudden changes, or unexpected outcomes. From earliest childhood on, curiosity and interest stimulate us continuously to explore the exciting new and unusual. Whether we like it or not, novelty seeking is a personality trait that sits in everyone of us. Novelty sparks our infinite interest in learning new things, acquiring new abilities, and making new experiences. »A mind that is stretched by a new experience can never go back to its old dimensions.« — Oliver Wendell Holmes Jr.
A Novel Experience, the perception and response that result from experiencing something new and different, keeps us engaged and excited, raises the emergence of new perspectives, and thereby encourages us to learn, adapt, and grow. In that sense, Novel Experiences create and define our prospective personal development and are continually expanding our horizon. They challenge our familiar perspectives, preferences, biases, and values, in a way that they can change our whole conception of the world. Hence, the confrontation with something new and different stimulates new ways of thinking, raises possibilities, and creates persistent memories. It transforms us into richer individuals. 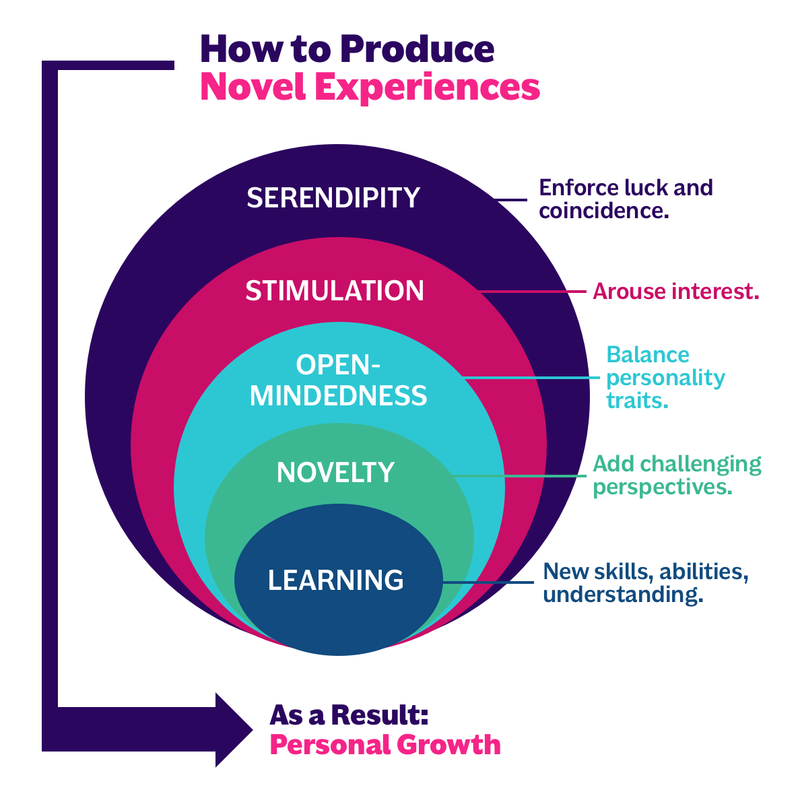 Without Novel Experiences we stagnate in our personal development — our worldview becomes static and resistant to change — we remain in a fixed state — and we hardly develop any new ideas or interests. As a result, we get bored and unhappy. Thus, in order to thrive and use our full potential, we humans need novelty in our lives. AirBnB is strongly enhancing their user experience with novelty. They encourage people to take advantage of new possibilities in their lives with products and services that are beautifully centred around exploration and discovery of the new and different. Besides staying over night at locals’ houses, they stimulate people to go out and experience something new and unfamiliar; like exploring foreign places, trying unfamiliar food, or connecting with other cultures who have different values and norms. Novelty aims to push AirBnB users out of their comfort zone by inspiring them to learn something new and different. As a result, users gain exciting new perspectives. The real charm and beauty of Novel Experiences lie in their power to transform and develop human beings. As we learn more, our attitudes and beliefs can change: In response to stimulating Novel Experiences — like living with someone from a different country for the first time — our paradigms can change fundamentally. In reaction to exposing ourselves to different perspectives and challenging ideas, novelty can create new worlds in our heads. Whenever we learn something new and different, the neurones in our brains can form new or stronger connections. That means over time we develop ourselves, increase our ability to empathise with others, and enhance our brains. Everyday we are confronted with new things that spark our interest and solicit our attention. However, it is more likely that we remember the very first time we have experienced something new. First time Novel Experiences are very powerful as they are strongly connected to emotions and thus create long-lasting memories. Nevertheless, the sequence of getting excited by something new decreases over time. When the thrill wears off, the human response naturally decreases, too. This explains why our very first encounter with something new produces the highest excitation: we tend to remember the first time we drove a car or our first live concert rather than their 100th time, respectively. When novelty becomes familiar and boring, we become stimulated again to seek out for something new that rewards us with new thrill and excitement. »Passionate surfer and skiers claim that the wave or the slope is never exactly the same. There is always that sense of newness and exploration«. Nothing holds our attention better than the unknown. The things that captivate and engage us all keep an element of surprise in theirselves. The infinite role of new waves stimulates surfers to stay motivated and engaged over time and thereby helps them to master the domain. The profound remix of perspectives enables us to learn, grow, and change. In that sense, filter bubbles and personalisation are working contra-productive in terms of personal growth. It is hard to change and personally grow when we rely on our old behaviours and stick to our current values. This is why we have to break our biases to unlock new opportunities. We have to actively invite Novel Experiences into our lives that interrupt the generalisations we make about the world. By focusing on balancing novelty adoption forces, the chances that we take a risk on something new and different increase. Emotional forces and how they drive or restrain novelty adoption. Not every human responds the same way to novel stimuli. Driving and restraining forces decide over our willingness to engage with novelty. If we can overcome restraining obstacles, like fear aversion, loss aversion, status quo bias, risk avoidance, or confirmation bias, our natural interest and curiosity will kick in and do the rest. We have to encourage people to cope with new challenges and difficulties. The more open we are for Novel Experiences, the better the chances to develop and change. As a return, we will be rewarded with good feelings, new understandings, or new skills. Attention means consideration. This is why we have to ensure that people are able to discover a diverse set of new and different things that can enhance their personal worldview. By enforcing luck and coincidence, chances for people to find something that triggers their attention to stimuli outside of their personal comfort zones increase and let new possibilities emerge. When attention is created, we have to encourage people to engage with novelty. When we provide for new stimuli, we can help people develop the mindset and skills necessary to constructively confront themselves with something new and different. Investing in their curiosity will be rewarded by Novel Experiences that promise personal growth and change. Fostering peoples’ open-mindedness is key to their willingness to adapt novelties. We need to focus on positive driving forces towards novelty while reducing aforementioned obstacles to increase the chance that someone will take a risk on something new and different. Add something new and different. Help people to see things from a new angle and transform the multiplicity of perspectives into a novel, unitary perspective which raises new questions that, in turn, result in new possibilities. Novelty can take advantage of possibilities in peoples’ lives and can create new opportunities. 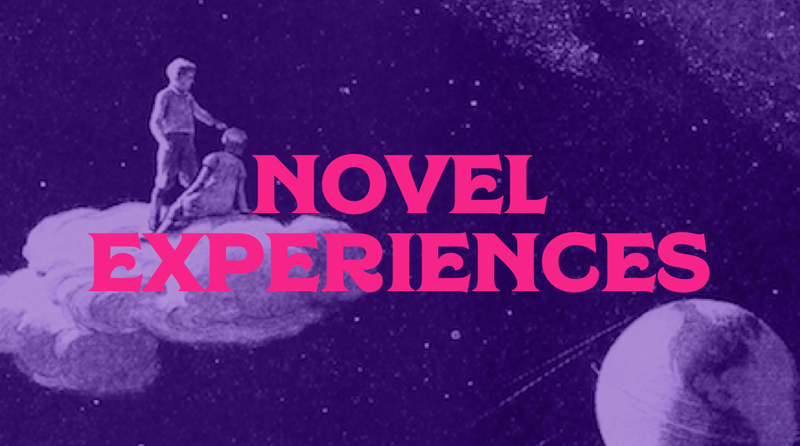 Make Novel Experiences deliver on their promise of personal growth. Novelty is a great way to guide everyone towards learning, that influences peoples’ abilities to gain new understanding, change opinions, and adopt new skills. When people are challenged to consider multiple sides, they gain a richer understanding of the world. In that sense, every challenge is a chance to grow and change. Thus, we always learn from engaging with novelty. Thriving and self-fulfilment is a natural human life goal. We cannot develop ourselves and make progress in life without continually experiencing something new and different. Novel Experiences enable us to use our full potential, and, thus, are a necessary pre-condition for learning, personal growth, and change. Hence, going through novelty shapes the path to our future selves. This is why creating novelty through design should be acknowledged as our goal.